Last week the Apple -Samsung patent brawl took a serious turn after Apple won a preliminary injunction banning sales of the Galaxy Tab 10.1 throughout the European Union, excluding the Netherlands. As we noted, Samsung had no idea any of this was happening until after the injunction had been issued, as is standard procedure in the German court system. Had the South Korea-based company known, they probably would have mentioned that the evidence Apple used to get the import ban (pictured at left) was pretty seriously flawed. 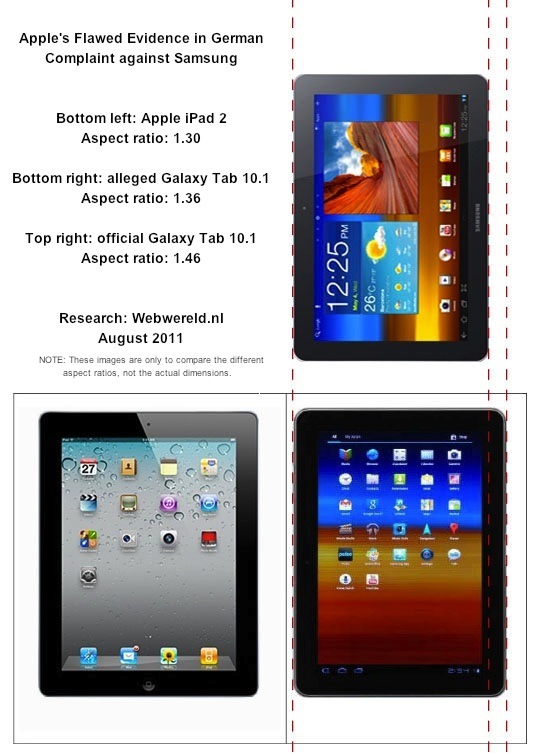 According to Dutch IDG publication Webwereld.nl, the image used for a side-by-side comparison between the iPad 2 and the GalTab 10.1 is either wrong or manipulated. On page 28 of Apple’s filing, the image of the Galaxy Tab 10.1 has been cropped and the image ratio has been tampered with. Samsung’s tablet measures in at 10.1in x 6.9in x 0.34in, while the iPad 2 sports dimensions of 9.5in x 7.31in x .34in. So if you were looking at the tablets side-by-side (both in portrait position), you’d notice that the iPad 2 is a bit wider from side to side, but shorter in length. Based on the specified dimensions, the aspect ratio of the GalTab would be 1.46. In Apple’s evidential image, the aspect ratio is 1.36 (8 percent wider than it should be), making the Galaxy Tab 10.1’s “overall appearance” look “practically identical” to the iPad 2 (which has an aspect ratio of 1.30). And that’s exactly the language Apple used in its complaint — also on page 28. We’ve seen our fair share of lawyer screw-ups lately, but this fairly shady, no? The current import ban on the GalTab is entirely related to design, so the court is truly judging these books by their covers. Presenting evidence that falsely represents the appearance of a product — especially when entire injunction is based solely on hardware/design — is incredibly suspect to say the least. Let’s add to that the fact that Apple had some serious alone time with the judge when presenting this evidence. Meanwhile, Samsung didn’t even have the opportunity to dispute the image. Whether the deception was intentional or not, “complete and truthful” evidence is a requirement in the German court system. At a surface level, this doesn’t look good for Apple. It’s entirely possible that the picture they used of the GalTab was an outdated pre-release image. Even so, the fact that false evidence was submitted at all makes Apple look sneaky and weak. Snweaky. Plus, this “mistake” could change the outcome of the case, according to a PC World interview with Florian Müller, a German IP consultatnt.